Open the file in the folder above. Using data validation, ensure that a drop-down list is available for country selection. 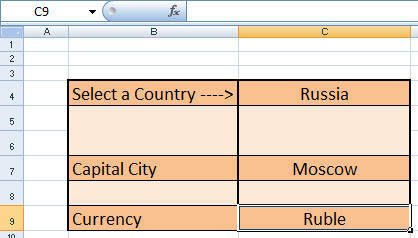 Create a range called Country on the Info worksheet which will provide the list. Formulae exist in the cells below, but you don't want anyone to be able to amend or view them. Apply the necessary protection to ensure this. Note that you cannot see the formula above. When you have validated and protected this sheet, save the file as Countries Locked Down.